That John Williams signed on to the original Home Alone is surprising enough, but that he also agreed to score Home Alone 2: Lost in New York is even more so given the number of good sequels that he passed to another composer (Superman II anyone?). The story goes that it was the Christmas aspect that the composer relished, one certainly doesn't imagine that he would be drawn to scoring the slap stick comedy. While the setting may be different, Home Alone 2 largely recycles the plot and general outline of the original, but, until the unnecessarily unpleasant showdown between kid and comedy villains at the end, is quite charming enough and certainly presents New York as a dazzling place to be at that time of year. Home Alone 2 is the kind of sequel that doesn't carry on the story so much as rehash the original film with superficial changes. However, for all that, only a couple of passages - notably Holiday Flight and Preparing the Trap - are more or less repeated wholesale. Of course all the original themes are reprised at some point, from the sweet Somewhere in My Memory, to the equally fine melodies elsewhere, my favourite being Williams' playful tune for Culkin's character as he explores the initial fun of doing his own thing. However, there are plenty of new delights to savour, particularly Merry Christmas, Merry Christmas which appears with disappointing infrequency during the score itself, but the full choral version that functions as the end credit should be added to the roster of spirited, festive songs that do the rounds every year. It's certainly a pleasant relief from Slade. Perhaps the biggest pleasure of both the Home Alone scores is that they have so many delightful asides; here Arrival in New York instantly conjures the sensation of arriving in a big city, lit up and inviting. Duncan's Toy Store echoes this, but with a more homely feel, while Distant Goodnights has the kind of genuine affecting emotion that is missing in so many modern comedy scores. Indeed, the film's own emotional impact is greatly improved by Williams' music; true, it goes into overdrive for the big reunion finale, but at least Williams has led us to that point and not trotted out a huge orchestral climax every five minutes. In any event, after the expertly written, but not as musically engaging material for the showdown with the thieves (the only section that is largely more valuable in the film than on disc) and the thrilling Into the Park, a big feel good climax is almost obligatory. Elsewhere, the action sees the composer at his playful best, although with just the right element of danger where appropriate. 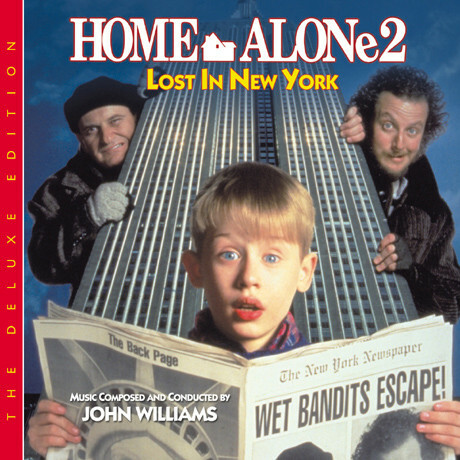 Of all the scores to re-release as a deluxe edition, Home Alone 2 doesn't seem like the most obvious, but as with most Williams scores, he is a fine enough composer to ensure that even a film this slight has a score worth hearing in its entirety. Therefore, even at over an hour and a half, there are only a couple of slack periods (the Booby Traps sequence, while technically accomplished, isn't really great as pure music) and the seemingly endless stream of memorable themes and motifs means there is always something to enjoy. The bonus material is especially fascinating, particularly the jazzy alternate Holiday Flight which is a long way from the Tchaikovsky inspired version from the films. I think it was rather hope over expectation that Columbus would go with something different for a scene so clearly reprised from the original, but in any event, alternate takes - especially one so unlike the final version - are invariably fascinating. Varese's Club edition is, unsurprisingly, immaculately produced, with superb liner notes. It also boasts superior sound as the original album was incorrectly pitched due to a mastering error. Not liable to bother most, but those with perfect pitch must find it infuriating! The bonus material takes completeness to the Nth degree and, while little of the extra music in the main body of the score is missed on the generous original album, all of it is worth hearing. I suspect that many will still be satisfied with the original album, (which is somewhat difficult to find these days) as it does contain all the best material and the mixing defect isn't a great issue. However, Varese's release is still a delightful treat and being Williams, likely to sell out sooner rather than later. Either way, one of the most engaging and underrated scores in the Williams canon and the perfect Yuletide musical accompaniment. Varèse Sarabande celebrates the tenth anniversary of Home Alone 2: Lost In New York with a very special 2 CD 'Deluxe Edition' release. While it may seem odd that a score only ten years old even requires a deluxe edition so soon, Home Alone 2 is an unusual case indeed. This new CD features cues never before available, including alternate, never-before-heard cues that take a radically different approach to the ones that actually ended up in the film. Additionally, and very importantly, this release corrects a very odd anomaly that afflicted the original Home Alone 2 CD. The original soundtrack release was not mastered from the first-generation session masters and, the tape that it was mastered from, was even running at the wrong speed! The sound improvement that this completely new, composer-approved, mix and mastering renders is nothing short of astounding. It's like listening to the entire score for the first time. The rich, full-bodied orchestra is made all the more glorious with John Williams' four breathtaking, original, and now much-loved carols; Somewhere In My Memory, Star of Bethlehem, Christmas Star and Merry Christmas, Merry Christmas. They're all here ... the cues you've always loved, the cues you've always wanted, cues you never knew existed, and all sounding better than ever. The deluxe 20-page full color booklet features extensive liner notes and many film stills.